LET ME INTRODUCE MYSELF...I’m the ORIGINAL...JENNY-WINE... WON’N’ONLY POOR OL’ GEORGE™. 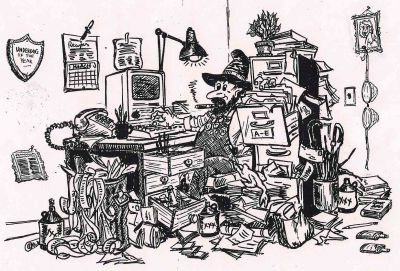 A national tabloid nuzpaper wrote a story about me, claimin I wuz an alien frum outer space...it ain’t true...I’m actually frum Possum County™ (sum folks say that Possum County is outta this world). Sum times I’m called a weirdo, asyslum escapee, kountry philosopher and lotz more things that we can;’t go into here. I’m an ex-circus man...I wuz billed as the WORLD’S TALLEST MIDGET or the WORLD’S SMALLEST GIANT...whichever the folks were willing to spend money to see. Fur years I’ve been a moonshiner (but that’s aginst the law).... so as a “frunt” I’ve been publishin a krazy cal-en-dur called the Poor Ol’ George™ Cal-en-dur. I wuz also the eddy-tor of the Possum County Nuz™. We printed the nuz that wuz fit to print ...and then sum! We covered stories that Dan Rather missed and that Paul Harvey didn’t care nuthin about. I wrote about the cummings and goins here in Possum County.™ Among other things there wuz stories about a gal that works down at the FILL-ER-UP TRUCK STOP. Her name is “Jiggles” Johnson...and she’s our Number One Tourist Attraction. I also covered the famous Possum County™ Tornado...in 5 minutes it did over $1,000,000 worth of improvements here in ol PC. Actually my main goal in life is to STAMP OUT SERIOUSNESS They say laughter is the best medicine ...I wanna be your Laff Doctor. REMEMBER THIS.....NEVER TAKE YER PROBLEMS TOO SERIOUSLY...and always try to have as much fun as POSSUM-able! It was a humorous look at the "little house out back" of Grandpa's day. 48 pages with over 50 pen & ink drawings of funny and unusual outhouses plus 8 pages in full color. 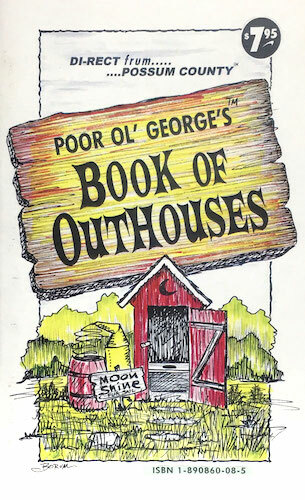 Learn more about outhouses than you ever wanted to know....all tongue in cheek. 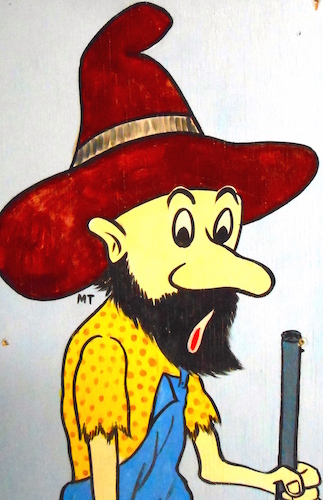 Also read about the life and times of Poor Ol' George™ and other residents of Possum County™. This humorous book was originally published back in 2005 by Poor Ol' George™. If you like reading and laffing about the "good ol' days'' YOU'LL LOVE THIS BOOK!